Our 2nd Balinese evening was a succes again! After introduction of the evening with mysterious Wayang kulit, Saling Asah brought, assisted by some members of Dwi Mekar a multi-purpose steel card of Balinese music, with as highlights Cendrawasih and the new creation Paksi Mengiber. This was closed by Janger, lively Balinese songs. After a pause by which the public enjoyed delicious Indonesian snacks followed the part of Dwi Mekar from Bali. They completed the evening with some less known, but very beautiful numbers of which the Nelayan dance, which is a mini play, and the Wireng Jaya. The evening was closed with by Topeng Bondres, a typical Balinese comedy mask act. We thank the public and we hope that next year we can organize a Balinese evening again! 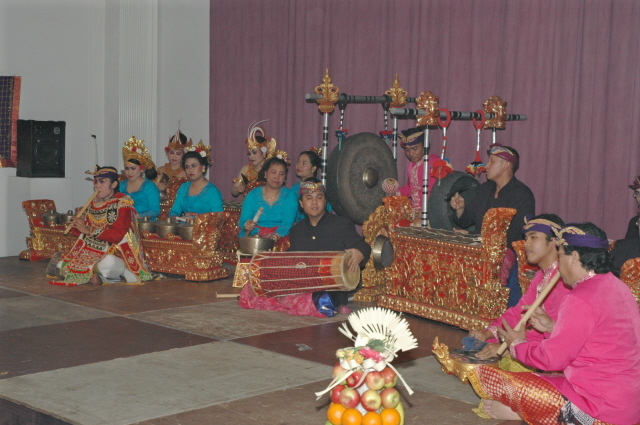 Photoimpression of the 2nd Balinese evening 1april 2006. Photoimpression of the 1st Balinese evening 21 june 2005.